You already know that you can talk to the entire world through the Internet, and many types of people use many different websites to entertain and inform themselves. Each person has their own type of service, application and even search engines. There are some who choose Google Chrome while others may prefer Firefox or Internet Explorer instead. The issue that is raised here is related to the idea of compatibility. It’s really important to understand that if you create a website for your business, you need to make sure that your particular website is compatible with as many programs and applications as possible. Is Linux a great choice when it comes to the hosting platform or should people use Windows instead? The answer to this question really depends on the needs of the ones that raise the question. Basically, the language in which the code is written and the database where the data is stored are the main differences between the two names above. In addition, the operating system that has been used for the hosting domain will not have any effect on the one that the user has at home. This is strictly a back office aspect that website owners need to have considered. An issue that should be illustrated here is the idea of security. There are companies that argue the fact that Linux is more powerful when it comes to handling hacker attacks, while Windows is much more vulnerable.. Research of security is up to the person choosing the right server for them, as both Windows and Linux have different strengths and weaknesses. It’s really important how the information is secured and does not necessarily have to do with the server OS chosen. There are examples of Linux hosting platforms that have been attacked as well because hackers have used Linux in their attack and have knowledge on how to infiltrate the system. Another aspect to think about is the idea of accessibility. Believe it or not, Windows is a more popular operating system, therefore there are more applications available for Windows than for Linux since that’s the system application creators know about and use. It might be an issue of opinion, but there are many examples in which programs developed for Windows didn’t work on Linux. This is another issue to think about when it comes to choosing an operating system. Furthermore, there isn’t any real proof that one is easier to use than the other one when it comes to accessibility and user-friendliness. Both of them have proven themselves worthy of the attention that hosting companies offered over the years because they delivered a high quality service. The web editor is something that you should be thinking about when it comes to the choice that you need to make when it comes to server OS. This is because some web editors work splendid with a certain operating system while others are not that compatible. It’s really something that you need to think ahead about as it can make all the difference in the world when the design company creates your website. In conclusion, it doesn’t really matter which server type you choose as long as you know what you’re looking for in the end. There are some differences between how each of the operating systems, but neither Linux nor Windows reigns supreme just yet. It might be just like Samsung and Apple, Mercedes and Audi – here are some differences, but the service is the same in the core. With all these said, details make all the difference in the world, so you need to see how these environments have helped other companies. Having a little research done can turn your head in the right direction. The role of testimonials and feedback from others is to prove that something was good or of poor quality. 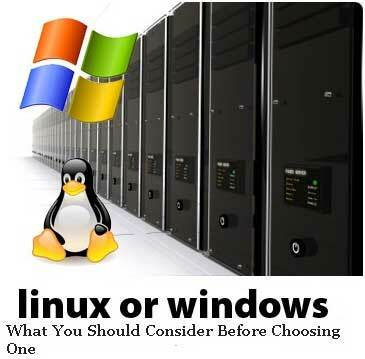 This article is about Linux and window hosting, where writer Leo Preston elaborates, which server is better and what factor should consider before choosing one. She express her gratitude’s Kate’s Best Web Hosting for their ideas. Web hosting companies offer a wide array of services today, some which come at a price and others which are free of charge. The free service is mainly sponsored by advertisements placed on the website; therefore you get to pay indirectly for the service. At the most basic level, web hosting entails small scale file hosting where files can either be uploaded either through an interface or using File Transfer Protocol (FTP). The files require very little processing for them to be delivered to the cyberspace. Web hosting is basically used for simple and small websites but complex corporate websites need a very sophisticated and high level of database support as well as platforms for application development e.g. PHP, ASP.NET, and Java. It further has an interface panel like cPanel, Plesk, and Hosting Controller which make it possible to have manageable e-mail service that will make it easy to install scripts and manage the web server more adequately. In other cases, web hosts specialize in a particular service or software, hence are hired by corporate establishments and organizations to outsource work to a certain company. Web hosting further entails hosting uptime which is the total percentage of time that the host is reachable, or rather, accessible to surfers on the cyberspace. Most companies aim to offer a hosting uptime of up to 99.99%. In interpretation, this will mean that in a year, the downtime will be circa 8 hours and 46 minutes. Be advised though that planned interruptions for whatever reasons together with server maintenance and restarts are a reality and shouldn’t be ignored altogether. The web hosting business has become a very competitive one; no wonder the industry players are becoming more and more creative when advertising their products and services. They put together very many client benefits into their user-friendly packages, inclusive of free services. Granted, if the services are free, why would anyone bother to pay for the same service? Well, the old expression you get exactly what you paid for becomes more valid in this instance. For one, free services offer very limited services and secondly, because they don’t charge you to host your website, they will need to generate some revenue off it. This they do by maybe placing advertisements on your website. Chances are you will not have any control of the kinds of, and number of ads placed on your site. Such free services are also known to restrict the kind of content put on a website. In some cases, you may not even be able to have videos or music on your site, or even sell any products. Needless to mention, the ads placed maybe competing with your products, but it’s a matter of take it or leave it. 1. Business travel is one of the main sources of business cost! Keeping track of your outgoing and incoming finances is crucial in staying afloat as a business. Organization is key, so make sure you’re aware of any money coming in, any money that hasn’t paid and vice versa. Expensify is a smart and efficient app that takes the stress out of calculating the expenses for business travel. Presenting you with an expenses report as well as being able to track your spending via GPS technology, you can connect the app to your credit card or bank account! This app is also free- making it very worth while your time. 2. Face to face meetings cost you crucial time. More often than most, video conferencing is the preferred alternative for everyone concerned – it enables you to fit in a meeting without the hassle of travel and losing time. Make sure you’re using a free video calling server- there are many free videos calling service available, such as Skype, Google Hang Outs or freeconferencecalling.com. All of which let you have that important meeting – whilst staying behind your desk. 3. Get familiar with budget friendly SEO tips that won’t require a brutal denting to your bank balance. Search Engine Optimisation is frequently used to promote businesses across the internet- enabling smaller business that aren’t aided by a massive budget, to achieve a higher ranking on search engines by simply using a few tricks of the trade. An important point to remember is the importance of quality content! With great quality content you’re demonstrating your value to customers, and effectively presenting them with something that will keep them coming back for more. In addition, keywords are also a great way to divert traffic towards your businesses website! Keywords are what search engines will pick up on, so choose wisely and make sure you’re meta titles aren’t too clumsy and long, remember to be concise, short but informative. 4. Set up your website on WordPress and you’ll cut the costs of hiring a web designer, coder and all sorts of other hefty costs. WordPress is a smart Content Management System – and not just for bloggers – but for businesses too. Set yourself up on a decent server first of all to make sure your site runs smoothly (you can find reviews here which might be helpful if this is new to you) and then choose a premium theme (don’t go for a free one as they can be a little generic looking) to personalise your website. The money it would cost you to do all of that with a web designer of development would be in the thousands, so you’ve definitely saved money here. 5. Potentially the most obvious tip, however no less important, is the way the in which technology makes paper costs unnecessary. With the rise of technology and media, virtually every company loyally stick to communicating via email rather than through letters. Not only does it save you ink and paper, it’s also a great deal faster and comes with a lot less hassle. E-books and online reports also save you from incurring a massive cost that simply isn’t necessary. Try and avoid producing paper documents as much as you can, and you’ll seriously notice the difference in saving. 6. Open source software. Embrace the wonders of Cloud software, like so many business who have saved much needed cash by making use of this easily accessible medium to access data for employees. Cloud brings with it flexibility, improving efficiency and productivity, by allowing employees to access the database where they are only requiring an internet connection to do so. The main advantage is of course the lowered IT costs- Cloud software won’t require any of the hardware costs that come with the maintenance and upgrading.